We recently tried the Kani Salad from Tokyo Tokyo and I liked it. The salad consists of shredded artificial crab sticks and mangoes in a bed of fresh lettuce leaves. The dressing is plain Japanese mayo topped with fish roe or Tobiko. It's a cool and refreshing salad which can go with any Japanese food or can be eaten solo. It tastes more like California Maki minus the vinegared rice. The serving is just right for two people and at its price of around PhP65, it's a good buy. SM City Marilao and SM City Baliwag are on a search for the best Pancit Marilao and Pastillas dessert in Bulacan. This is in time for the Singkaban Festival in Bulacan through their My City My SM My Cuisine cookout challenge. 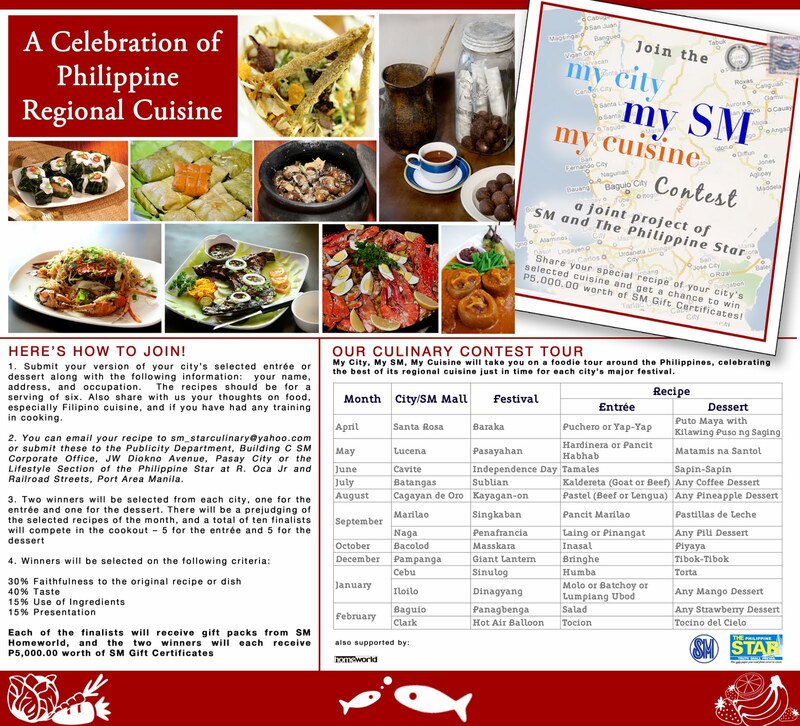 The SM Supermalls launches the second leg of its campaign this year with My City, My SM, My Cuisine, a project that aims to discover the country’s rich culinary heritage by identifying, collecting, retrieving, and promoting traditional recipes and culinary techniques. It's a mall based event that will highlight Bulacan cuisine and the heirloom recipes of prominent personalities in the province. 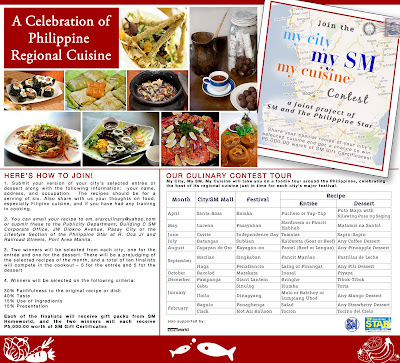 The culinary contest featuring Pancit Marilao and Pastillas dessert is open to all SM shoppers in the province. If you're interested to join, all you need to do is to submit their recipes for Pancit Marilao for main course or any Pastillas for dessert through email at sm_starculinary@yahoo.com or smmarilao_publicity@yahoo.com. You can submit either or both recipes which should be good for six persons. You must include your name, address and occupation with your submissions. Deadline for submission of entries is on August 12, 2011. There will be a pre-judging, and a total of ten (10) finalists, five for the entrée and five for the dessert, will compete in the cook out on September 8, 2011 in SM City Marilao. Two (2) winners will be selected, one for the entrée and one for the dessert, who will each receive P5,000 worth of SM Gift Cheques. The other finalists will receive a gift pack from SM Homeworld. What's for Merienda? Pan de Sal with Peanut Butter Ice Cream filling! We were thinking of what to have for merienda this afternoon when my mother suggested pan de sal, a bread that's eaten traditionally at breakfast. We bought some from Pan de Manila, a bakery which specializes in pan de sal baked in pugon or brick oven. Pan de sal goes well with cheese or butter but this afternoon, we tried something new. We actually fell for this poster showing the pan de sal with peanut butter ice cream filling. The peanut butter flavored ice cream was exclusively created by Nestle Philippines for Pan de Manila. Although I am not a big fan, I like trying something new. It doesn't look like something that could kill me, so I grabbed one tub to go with our pan de sal. The ice cream is so sweet and all I could taste after a few bites was its sweetness and no hint of peanut butter. My father even said that it tasted more like mocha flavor than peanut butter. Also, the idea of using it as palaman or filling for the hot pan de sal doesn't seem to be good one. It melts so fast that you end up with fingers (and mouth) dripping with soupy peanut butter ice cream. We also observed that it melts than the average ice cream even when it's still in the tub. Nestle needs to improve the ice cream if they want this partnership to last long. As for the pan de sal, I suggest that we stay for the more staple palaman of cheese, butter or guava jelly. In his latest book, David Sedaris stopped talking about his self and made animals do the talking for him. The result is Squirrel Seeks Chipmunk: A Modest Bestiary a compilation of short fables that are more for adults than for children because they can be quite disturbing.. Disturbing because Sedaris gave the animals human qualities, weaknesses and problems. We find an altruistic mouse taking care of a snake, a vain sheep meeting a manipulative crow, and a squirrel and chipmunk dating against the wishes of everyone around them. The other characters are equally not so good models of good behavior. Unlike in other stories where animals behave the way they naturally do, the ones in this bestiary are more human than animals. I cannot blame anyone who, at one point while reading this, would ask why even use animals when human characters would do. It's also the outcome of the stories that they can be quite disturbing to the reader. Somehow, because of their bad behavior and weaknesses, the animals end up dead, eaten, clobbered or chained. And everything was told in graphic and grisly detail. Fans of David Sedaris who are used to his funny autobiographical musings will be surprised that his usual wry humor was stripped to the minimum in this volume. The lack of humor may or may not be because the author decided not to be funny. There are some moments here and there but on the whole, most of the stories failed to be funny. One might think that Sedaris must be running out of things to say and decided to take the fables route. Unfortunately, he was like a fish out of water. Apple today released Mac OS X Lion their most advanced operating system. It's now available on the Mac AppStore and I am currently downloading this. It says that my download will be finished in 8 hours! Ugh... thanks to my DSL connection. And it's not only Lion that Apple rolled out today but also a refresh of MacBook Air and Mac Mini. Both machines come pre-loaded with Lion and now sport the latest Thunderbolt technology which promises connections speed of up to 20 times faster than that of USB 2.0. With this new technology, you can connect up to six devices to your Mac. The new Mac Mini and the MacBook Air now sport the dual Intel Core i5 processors. This makes this new generation 2 times faster than the last. It will prove very helpful when using processor intensive applications. With release of the new generation MacBook Air, Apple chose to "kill" the white plastic MacBook. They also decided to make the entry-level 11 inch MacBook Air more affordable, at USD999 on the US Online Store or PhP49, 999 from the Apple Philippines Online Store. I am looking closer at the MacMini though, priced at PhP30,990 on the Apple Philippines online store (with 3-day free shipping). In this new machine, storage will not be a problem since they decided to bump up the hard drive to a hefty 500GB. So we can stock our pictures, videos and music in the Mini. Should this be not enough for your needs, you can further upgrade your hard drive to 750GB without affecting the speed of your machine. Oh, and just like in the previous generation, upgrading your RAM is a cinch with the removable bottom panel. You can upgrade your memory to up to 8GB! Apple decided to remove the superdrive from the MacMini. Yup, just like with the MacBook Air, the optical drive is now an option with this new generation. I wonder if they will also do this with the other desktops like the iMac or the MacPro. Perhaps the decision was reached because you can now download from the AppStore the applications you want to install on your Mac. You can back up your files in the iCloud or in an external drive that has either USB or Thunderbolt connection. Movies and music are also available and downloadable from iTunes. In other words, Apple does not see the need for an optical drive anymore so they dispensed with it in the new MacMini. When the first part of Harry Potter and the Deathly Hallows ended last year, I began waiting for the last movie in this series. I was already conjuring images of how the final battle would look like, with witches and their wands, as well as goblins, house elves, and centaurs included in the mix. It would be a grand end for this epic. I decided to watch the movie on its first day of showing, and in IMAX 3D no less to get the full experience. Did I enjoy it? Yes. The movie was well made. It tried as much as possible to be true to its original source. It has all the ingredients of a highly entertaining movie. It has lots of excitement as our hero and his friends went to get one of the horcruxes in the dungeons of Gringots Bank. I particularly love the effects on their ride going down and their escape on the back of a half-blind dragon. It also has drama. In fact lots of it as many of the characters we came to love, admire and hate die one by one in this movie. And of course there's also the usual light moments, laughter and romance courtesy of the young wizards. The effects are also great from beginning to end. Aside from the above mentioned dragon, there are other parts in the movie which took advantage of the latest technology. The music also added to the mood of the movie. So what is there to not like in this last of the Harry Potter movies? Well, if you are a Harry Potter fan and you read the book over and over to prepare for this last installment, you're in for a big surprise and somewhat disappointment. Why? Because David Yates and his team took a lot of liberties to change many of the elements in the book, especially in the final battle between the forces of Voldemort and the defenders of Hogwarts. Don't expect Kretcher and his legions of house elves to come out to defend Hogwarts in the name of his master. Also, the Centaurs will not make any appearance at all. The townsfolk of Hogsmeade will also not come to help the embattled wizards and witches. But my greatest gripe was how the final battle was treated. Those of us who read the book all know that Harry Potter and Voldemort had their final encounter in front of what remained of the battling crowd. That Harry, after coming back from the dead, courageously confronted Lord Voldemort one last time and succeeded in finally defeating him. Instead, we see Harry running away from Voldemort and Nagini the snake (which if they followed the book should have been dead at this point) in most of their battle scenes. When he was cornered, Harry pulled the Dark Lord off a balcony of Hogwarts. Yes, that's the scene in the trailer which many of us wondered where it came from in the book. I am disappointed at this because I think it somehow diminished the importance of Harry's death, his talk with Dumbledore at King's Cross Station and then his return to win this battle. 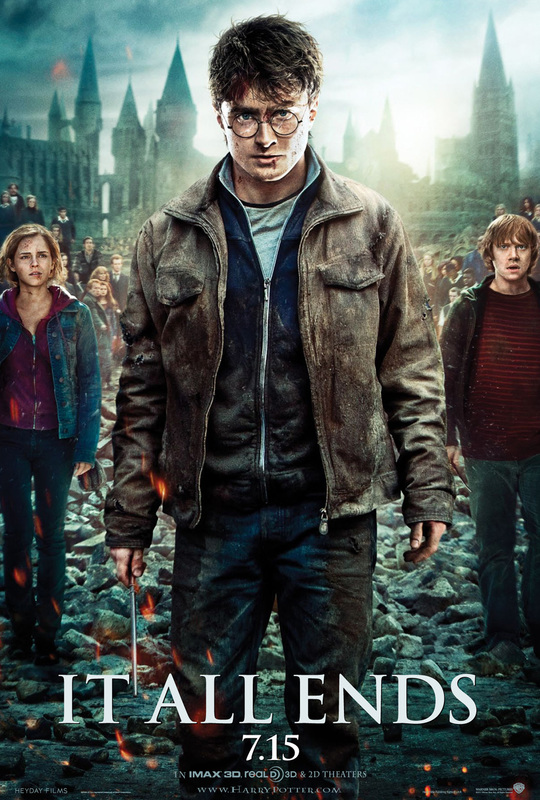 The final blow is, it wasn't Harry who ultimately killed Voldemort but Neville Longbottom! You'd wish that Harry will stand tall in front of his school mates with the evil dark lord dead at his feet. Instead, they decided to make He-Who-Must-Not-Be-Named disintegrate to pieces, perhaps to take advantage of the 3D technology. What stopped me from going home thoroughly disappointed with the ending of the film was they decided to include the epilogue of the book. Yes, the one where we see our heroes 19 years later as they bring their kids to Hogwarts Express at the start of a new school year. It's a fond farewell for the boy wizard we followed for the past years. Now I have another reason to eat at McDonald's (aside from their coffee and pancakes)! Starting yesterday July 2, McDonald's brought back its Coca-Cola Glass in a new cute design. They call it the Coca-Cola Glass Can because it takes the shape of a Coke in Can. This new collectible for Coke fans like me comes in 6 colors - lime, green, charcoal, pink, purple and blue. As you can see in the picture below, I already got the lime, green and blue ones. I'm definitely coming back for the other three colors. I was informed that the pink one is the bestseller. To start your own collection, order any McDonald's Extra Value Meal and then just add PhP25. Better hurry though since this will be available for a limited time only. As I've said earlier, some of the more popular colors are going really fast. I like munching on crackers and one of the snacks I like to indulge in is Monde's OneOne Rice Crackers. I discovered this a few years ago and it's been in the market for some time already. It is very crispy but does not disintegrate once you bite it. It somehow dissolves in your mouth like a wafer. What I like about this snack is that it has a unique taste that's so unlike the available chips in the market. It is not too salty and it does not taste like it's been rolled in a bed of MSG. Once in your mouth, the flavors just burst and fills your tongue. One One also comes in a spicy variant but it is too spicy for my taste. I stick to this original flavor. I bring one pack to the office and snack on it the whole day. It also goes well with my favorite soda.